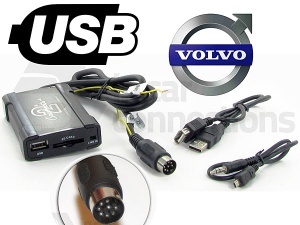 Volvo USB adapter interfaces for Volvo C70 S40 S60 S80 V40 V70 and XC70. Connect USB devices such as portable hard drives and USB memory sticks full of your favourite MP3 music files and play the audio through your Volvo factory fitted car stereo. Suitable for Volvo models with HU403, HU555, HU601, HU603, HU605, HU611, HU613, HU650 and HU803 factory fitted car stereo models. Volvo USB adapter CTAVLUSB001 for Volvo C70 S40 S60 S80 V40 V70 and XC70 Connect USB devices such as portable hard drives, USB memory sticks and SD cards full of your favourite MP3 music files and play the audio through your Volvo factory fitted car stereo.